Donburi – 丼 – Large bowl full of hot cooked rice topped with various meats, fish, vegetables, egg etc. Genmai – 玄米 – Japanese brown rice. It is unpolished so it retains its natural colour and contains up to four times as many nutrients than white rice (but doesn’t taste as good unfortunately). Gohan/Meshi – ご飯/めし – Both meaning plain white rice, but also can refer to any meal in general. Beware, only males are allowed to use the word ‘Meshi’. Gyoza – 餃子 – Dumplings of Chinese Origin, most commonly filled with minced pork, cabbage, garlic and sesame oil. Miso-shiru – みそ汁 – Miso soup. This is a Japanese staple that can be found at almost every meal. Made from fermented soy bean paste, Dashi fish stock and often has Tofu, spring onion and Wakame seaweed floating around in it too. Mochi – 餅 – Small, chewy ‘cake’ made from sticky, sweet rice often topped with something yummy, such as red bean paste, soy sauce and seaweed or sugar and kinako (soy bean flour). Definitely do not taste as bad as they sound! Nabemono – 鍋物 – General term referring to all varieties of hot pot dishes. Try Shabu-shabu, a fun and socialable hot pot dish that is really tasty! Natto – 納豆 – One of the most hated Japanese foods among Westerners, this sticky, stinky fermented soy bean dish is very healthy, but can stink out a room in seconds. It’s definitely a ‘love it or hate it’ food. Often mixed with soy sauce and mustard for an even more ‘unique’ taste. Pan – パン – Word of European origin, literally meaning bread, it is sweeter than Western style bread and eaten as more of a treat (in contrast with the West who see bread as a savoury staple). Ramen – ラーメン – Originated in China, Ramen are thin egg noodles that are served in a flavoured broth with toppings of your choice, usually pork, seaweed, spring onion and fish cake. Shirataki/Konnyaku – しらたき/こんにゃく – Konnyaku is hard jelly that is made from the konjac plant (aka Devil’s tongue plant). Kuro Konnyaku (or black konnyaku) is mixed with Hijiki seaweed to give it a darker colour and more flavoursome taste. 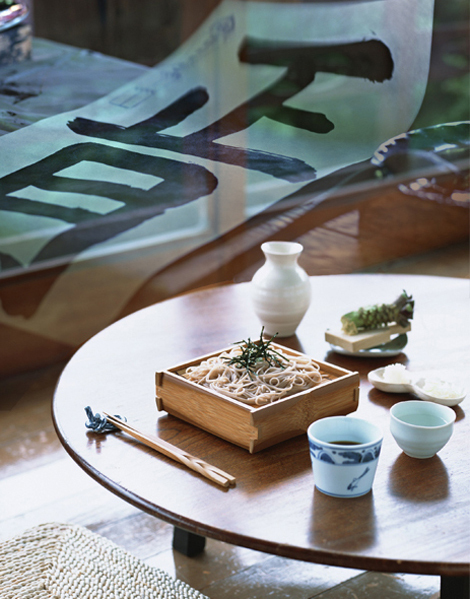 Shirataki is made from Konnyaku, but is shredded into a noodle shape. All are true health foods as they are low in fat and carbohydrates yet high in nutrients and fibre. Shoyu – 醤油 – Soy sauce. This liquid made from fermented soy beans, wheat and salt is a main ingredient in many Japanese dishes from Ramen to Teriyaki. Sushi – 寿司 – Not be confused with Sashimi, Sushi is not just raw fish! Sushi is vinegared rice mixed or topped with an array of ingredients, most commonly fresh fish or vegetables. Tsuyu – つゆ – A common broth to accompany noodles. Made from strong Dashi fish stock, mirin and sweet soy sauce, it has a deliciously rich flavour. Itadakimasu – いただきます – Litterally ‘I humbly receive’, it is important to say this expression at the beginning of every meal as gratitude to whoever has made the food. Gochisou sama deshita – ごちそうさまでした – Similarly, at the end of the meal it is customary to say this expression meaning ‘Thank you for you a lovely meal’. Kampai – 乾杯 – Cheers! Raise your glass and say it loud. Don’t take a sneaky sip before. Oishii/Umai – おいしい/旨い – Both these words means ‘tasty’ or ‘delicious’ and heard very often at a Japanese dinner table. It’s polite to say it even if you don’t mean it. O-hashi – お箸 – Chopsticks. If you’re good with them you might hear ‘O-hashi jouzu’, if not you won’t hear anything. Posted in Food and tagged japanese. Bookmark the permalink. These are really useful to know, thanks!